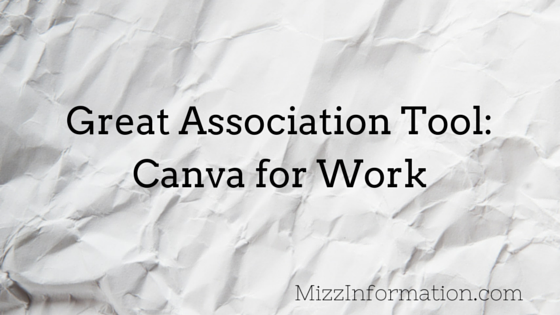 CANVA FOR WORK IS HERE! Ok, sorry, but I’ve been waiting for months for Canva for Work and I finally got access to it last week. Long story short: it’s pretty awesome, especially for small organizations with no in-house graphic designer and/or no budget to outsource graphic design. In this day and age where communications and marketing people are expected to also be graphic designers, Canva is an invaluable resource, allowing even people like me with no idea how to do graphic design to bootleg it for free or super cheap. I’ve long been a fan of Canva for blog stuff and easy work-related stuff; Canva for Work has only made me more of a Canva-holic. Here is a more comprehensive guide to Canva for Work than I personally feel like writing up–why reinvent the wheel, right? 🙂 The two features that I love and think are super valuable to small staff or small budget associations are Magic Resize and Brandkit. Even if you work for a larger association with in-house graphic designers, how awesome would it be if you could do simple stuff like resize graphics for each social media platform yourself without having to submit a request or wait for someone else to create what you need to share today? Bam–Magic Resize lets you take one graphic and automatically resize it for Twitter, Facebook, Pinterest, and other platforms–all with just one click. Brandkit lets you set your org’s branding–colors, fonts, logo–one time so you don’t have to start at square one each time you create a graphic. Brand Templates is also pretty great. I am working on setting all this up for SFPE and so far I’m really impressed with the UI and resulting brand kit. There are other features as well that I have yet to explore, but from what I’ve seen so far, I’m definitely a fan. I have used Canva in my personal/blog life to design presentations (the presentation I shared a few weeks ago? Canva.) and blog images (like the ones I use on Chic n’ Geek), and have also used the regular (free) version of Canva for work stuff. The headers for SFPE’s LinkedIn company profile, Twitter profile, Facebook page and YouTube channel? All the free version of Canva. Canva for Work, while not free, is definitely worth the price, IMO. It’s free for the first two months then $9.95 a month if you pay for a year or $12.95 a month if you pay monthly–a price that even the smallest budget organization can probably handle, and well worth the cost, especially if you factor in what Adobe Creative Cloud costs ($50/month)–not to mention learning how to do actual graphic design or outsourcing that. Even better, apparently Canva will soon be adding an experts program, to help augment non-pro’s (like me) rudimentary graphic design ability. What the Work version offers beyond the free version, in addition to Magic Resize, Brandkit, Templates and other features is the ability to create design teams (for an additional $9.95 per user), photo libraries…and I’m sure other features I have yet to explore. Whether your organization has no graphic design resources or has a dedicated design team, Canva for Work is definitely worth checking out.